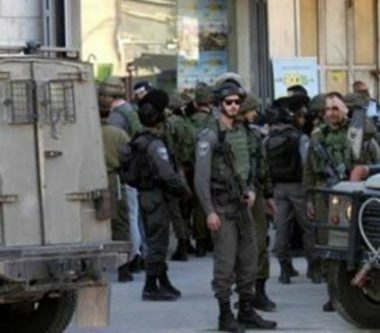 Israeli soldiers abducted, overnight until early morning hours Sunday, fourteen Palestinians from their homes, in several parts of the occupied West Bank, the Palestinian Prisoners’ Society (PPS) has reported. The PPS said the soldiers invaded and searched many homes across the West Bank, and interrogated several Palestinians before abducting fourteen. In Jenin governorate, in northern West Bank, the soldiers abducted Forsan Amarna, Mohammad Sheikh Ali, Yousef Masharqa, Nidal Enfe’at, Ahmad Tareq Abu Bakr and Shadi Kamal Mer’ey; most of them are from Ya’bad town. In Ramallah, in central West Bank, the soldiers abducted five Palestinians from the al-Jalazoun refugee camp and Doura al-Qare’ town, and abducted Anas Mohammad Nakhla, Mustafa Mohammad Nakhla, Yasser Najjar, Mustafa Ibrahim al-Beyari and Ezzeddin Sobhi al-Qadi. In Hebron, in southern West Bank, the soldiers abducted Mohannad Mirshid Awad and Mohammad Yousef Awad, from Beit Ummar town, north of the city, in addition to Mohammad Naji al-Atrash.